Book a demo with our Ph.D. The time has never been better to create a comprehensive eLearning system from our proprietary, easily customizable system. Organizations commonly struggle to keep engagement high when onboarding, developing or implementing change in the workforce, with traditional training sometimes falling flat. 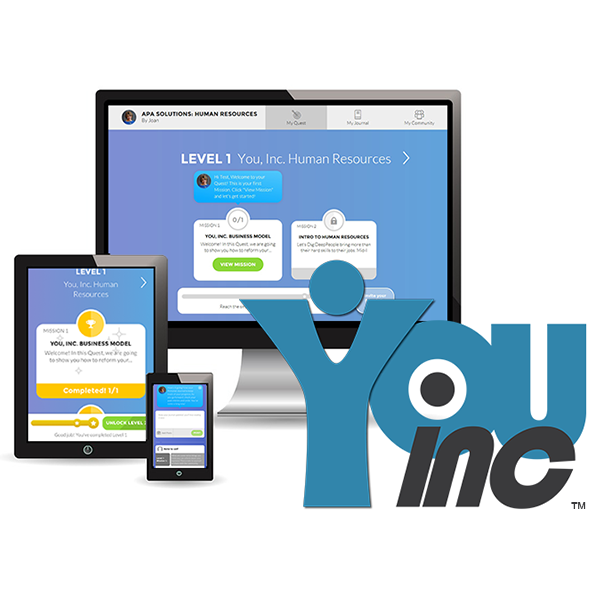 Designed with brain-friendly learning and streamlined development in mind, the You, Inc.™ eLearning system offers complete features and new technologies never before seen by any other learning experience platform. Who has the time or tools to build an effective, online-based training system from scratch? The goal of our proprietary system is to tackle that hurdle, providing an incredibly dynamic eLearning package at an affordable rate. Imagine a completed prototype that’s fully customizable, with self-awareness and habit forming tools that are scientifically proven to create an agile workforce through brain-friendly learning. It’s never been easier to bring your organization’s learning and development strategies to the 21st century.